Was James teaching about works contrary to the doctrine of being saved apart from works? The truth is most of the world’s religions require you to do things, in particular some amount of “good works” in order to be saved or be reincarnated as something higher and even to enter into paradise. It’s all about “do, do, do” but with Christianity, it’s “Done!” Just before Jesus died on the cross He said “It is finished’ (John 19:30), or as the Greek puts it, “Paid in full.” The Greeks used this phrase as an accounting term, like something being paid in full or completed, and that’s just how salvation is found in Jesus Christ. He paid the price He did not owe for a debt we could not pay. The Apostle Paul writes that it is “by grace you have been saved through faith. And this is not your own doing; it is the gift of God, not a result of works, so that no one may boast” (Eph 2:8-9). Paul couldn’t be any clearer; it’s not a result of our works but a result of Christ’s work on the cross. We could never do enough good works to save even ourselves because we have no righteousness at all (Rom 3:10-12). Christians know that they can’t do enough good works to save themselves in a million lifetimes because God requires a perfect life of obedience and since we are far from perfect, we needed the help of the sinless, spotless Lamb of God in Jesus Christ. He alone saves us (Acts 4:12) but once we are saved, not by works, we are saved to do works. This is what Paul wrote in Ephesians 2:10 where he wrote that “we are his workmanship, created in Christ Jesus for good works, which God prepared beforehand, that we should walk in them.” God won’t make us walk in the good works He’s prepared…we must choose to do them and if we don’t, we can lose rewards when we see the Lord Jesus Christ and He renders to each of us rewards done according to our works, if they are done for God’s glory and not our own. Since we know that we can never be saved by works, does this mean that we won’t have any works to do or we don’t need to do works? Of course not. We’re saved for works. Why then did James seem to write that works are tied in to our salvation? Is there a misunderstanding between Paul and James? Are they in agreement or disagreement? James, the step-brother of Jesus, was not a saved man during Jesus’ earthy ministry. He could not believe that Jesus was the promised Messiah and who could blame him? How hard would it have been to believe that your own brother was the Messiah; the Savior of mankind? I would say, exceedingly hard, if not impossible. It had to take a miracle for James to believe in Jesus and that’s just what happened. Once James finally trusted in Jesus Christ, Jesus was no longer just his brother but was his Master, Lord, and Savior. We might be pleasantly surprised that the Apostle Paul and James do not disagree with one another and are actually saying much the same thing. Martin Luther was said to have wanted to remove the Book of James from the New Testament because of his idea that James associated salvation by works but is this really what James was saying? Many proclaim to be saved and a few that I know of personally say that they’ve been born again, but a lack of works makes me question that for many reasons. James wrote that “someone will say, “You have faith and I have works. Show me your faith apart from your works, and I will show you my faith by my works” (James 2:18), but what did James mean by this? James is saying that “as the body apart from the spirit is dead, so also faith apart from works is dead” (James 2:26). 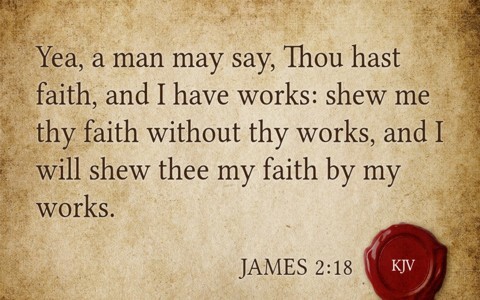 In other words, if a person says they’re saved but shows no works in their salvation, then James would say their faith is dead because they have no associated works which God had appointed for them to do. It is just as Paul wrote; “we are his workmanship, created in Christ Jesus for good works, which God prepared beforehand, that we should walk in them” (Eph 2:10). We’re not saved by works but we’re saved for works and works that God has ages ago determined that we should walk in, so James asks, “if someone says he has faith but does not have works? Can that faith save him” (James 2:14)? Of course the answer is no. If there is no fruit, there is no root. You can say “You believe that God is one; you do well. Even the demons believe—and shudder” (James 2:19). Someone that says they believe but has no works is no better than a demon because even the demons believe but that doesn’t mean they’re saved. James point is “that faith apart from works is useless” (James 2:20). For one thing, I am glad we’re not saved by works because we’d always wonder, “Did I do enough good works to save myself” and “how many good works is enough?” We’d never be able to have assurance that we’re sealed for that day of His visitation. When James wrote, “that a person is justified by works and not by faith alone” (James 2:24), he wasn’t saying we’re saved by works but we’re saved by faith alone in Christ alone but not being alone. That is, our salvation should produce the fruits of good works, not to be saved, but because we are saved. James asked, “in the same way was not also Rahab the prostitute justified by works when she received the messengers and sent them out by another way” (James 2:15)? Rahab showed she believed in God, not just by confessing Him with her words but professing Him in her works. She risked her life to save the spies of Israel and thus, proved that she did have faith. Her faith had feet on it. Words are cheap but actions speak much louder than words. We are saved by grace through faith…not through works or saying we believe. Works prove that a person’s faith is not dead but alive. Related reading: What Does it Mean to be Save by Grace? Resources – Scripture quotations are from The Holy Bible, English Standard Version® (ESV®), copyright © 2001 by Crossway, a publishing ministry of Good News Publishers. Used by permission. All rights reserved. Photo rendered from Logos Bible Software 6.0 Visual Copy. Previous post: Did Adam And Eve Have Belly Buttons (Navels)?